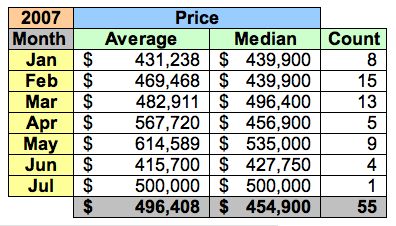 I had to omit the $82MM home in Glover Park and the $33MM condo in Kalarama from this table, at least until I verify whether the District recorded the correct prices; I doubt it did. "In a statement released early today, the company also said that 90 percent of the home loans it will now make will be to standards set by Fannie Mae and Freddie Mac, the big purchasers of mortgage loans, because it is not able to sell them to other buyers. 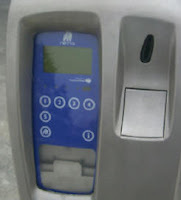 Less than two months ago, the company had said about 50 percent of its loans were eligible to be bought by the two government-sponsored agencies." A lot is left unsaid in this paragraph, but my take is they're pulling out of the non-conforming loan business. 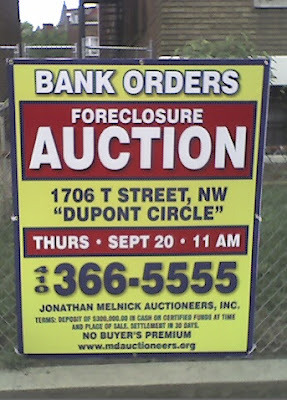 Jumbo loans, widely used in DC, are non-conforming since they exceed the $417,000 limit set by Fannie and Freddie. Since Countrywide is "the nation's largest mortgage lender," accounting for 17% of all mortgage loans in the US, what does this portend for the ability to get jumbo loans in DC and, moreover, for DC's housing market? An interesting article in today's WaPo. A growing number of condominium developers are backing out of projects as the worsening real estate market causes lenders to tighten their standards. For buyers, a project's cancellation can be an unexpected jolt. They get their deposits back but nothing for their time and aggravation. 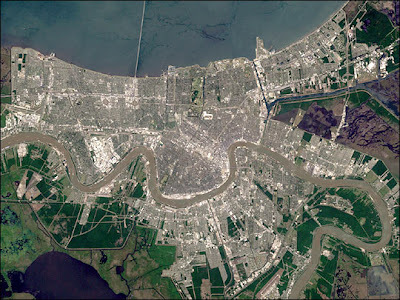 In the past 12 months, nearly 20,000 condo units have been removed from the glutted local development pipeline, said Gregory H. Leisch, chief executive of Delta Associates, a real estate research firm in Alexandria. 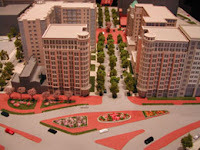 By Delta's count, in the second quarter of this year, developers abandoned plans for 22 local condo projects. The market's correcting itself and some unfortunate buyers are getting caught up. And projects are being canceled. The list of abandoned condo projects is growing. 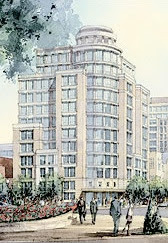 Level 2 Development of the District decided late last year to build View 14 at 14th Street and Florida Avenue NW as luxury rentals instead of condos. "It was clear to us from the sales pace and activity that we were going to have a difficult time preselling the number of units required to meet both the lenders' presale requirements and our own investment criteria," said Jeff Blum, a principal at Level 2. Earlier this year, the Joule in Arlington, developed by Ed Peete, also went from condos to rentals. In Leesburg, Comstock Homebuilding went so far as to repurchase 58 of the 316 condominium units at the Bellemeade for $12.8 million before selling the building to a Midwestern apartment operator in June. 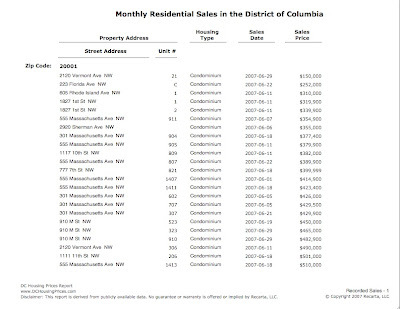 Today the WaPo discovered the idea of analyzing real estate sales by zip code. 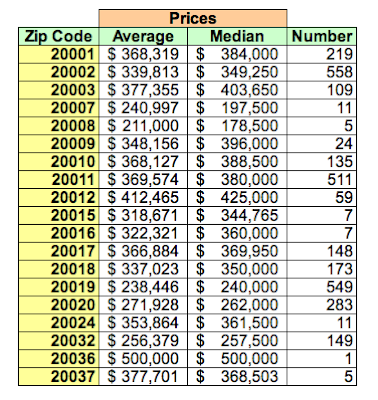 The article used higher average/median prices and dollar volume in zip code 20015 to prove its point that some zip codes are doing well. 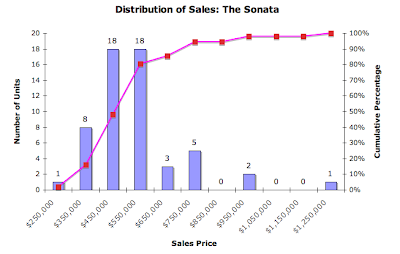 The story would have been stronger if it'd looked at unit volume, too, to see how it all tied together; as it is, the article told half the story. I don't dispute the WaPo's analysis, I've commented for several months that the high end real estate market is doing quite well while the rest of the market is on life support. 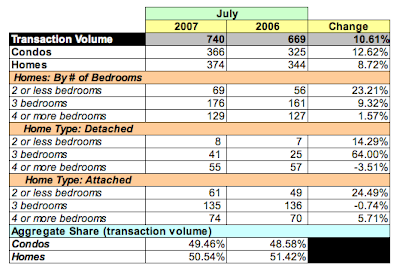 To show them a "best practice", I performed a similar analysis [June 2007 versus June 2006]. I included all types of housing [condos and homes] in the analysis so zip code 20015's data will reflect the "Chase Point effect"TM. 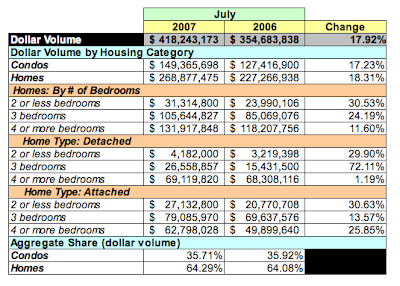 The table below shows the percentage change YoY for average/median prices, unit and dollar volume. 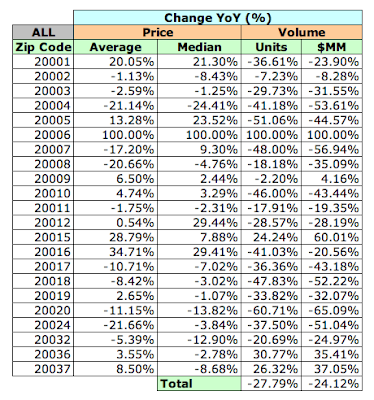 As the WaPo discovered, zip code 20015 had a good month, as well it should when you see that one home sold for $3MM, another for $1.6MM, that tired place for $1.2MM, and then all those $1MM condos at Chase Point. 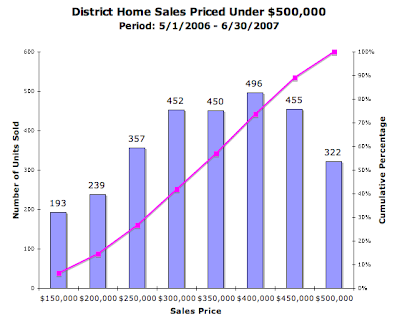 Zip code 20006 had zero sales in June 2006 so anything in June 2007 is a good thing. 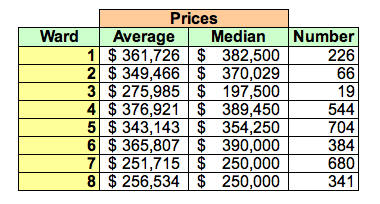 Average and median prices rose in zip codes 20001, 20005, 20010, 20012, and 20016 despite falling unit and dollar volume; one can only assume that high end homes/condos were responsible for the price growth. 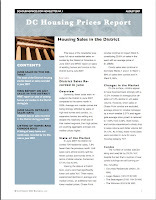 The real story is that of 22 zip codes in the District, 17 had lower sales volume [unit and dollar]; of those, 11 also had lower average and median prices. That didn't make today's WaPo. Ultimately, while the WaPo is accurate in reporting that some zip codes are doing well, it's cold comfort to the rest of us to be told once again the old story that the wealthy are doing well. After 40 years, the hotel was looking a little tired. So its owner said it was time to shut down for 18 months and launch a $170 million, top-to-bottom renovation of the landmark 13-story building on Virginia Avenue NW on the banks of the Potomac. But what happened to the plans for a co-op? For Monument, the hotel renovation was Plan B. The company bought the hotel with the intention of converting it to upscale cooperative apartments. 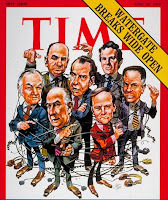 Some residents in the Watergate complex argued that a hotel was better for the health of the Watergate complex and challenged the conversion in court. 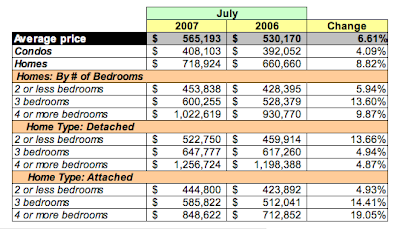 Meanwhile, the condo market softened and the hotel industry thrived. 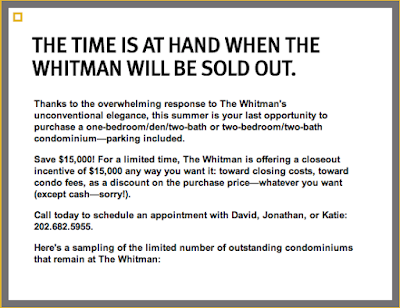 With all that, Darby [principal of Monument Realty] said, "it was an easy decision." [The buyer is] considering a property along the canal, Blue Point Villas, where the developer is offering to pay her mortgage for six months, plus six years of condo association fees, $5,000 toward closing and a 15 percent "developer closeout" discount on the sale price. I might be able to buy that beach Route 1 front retirement home after all!